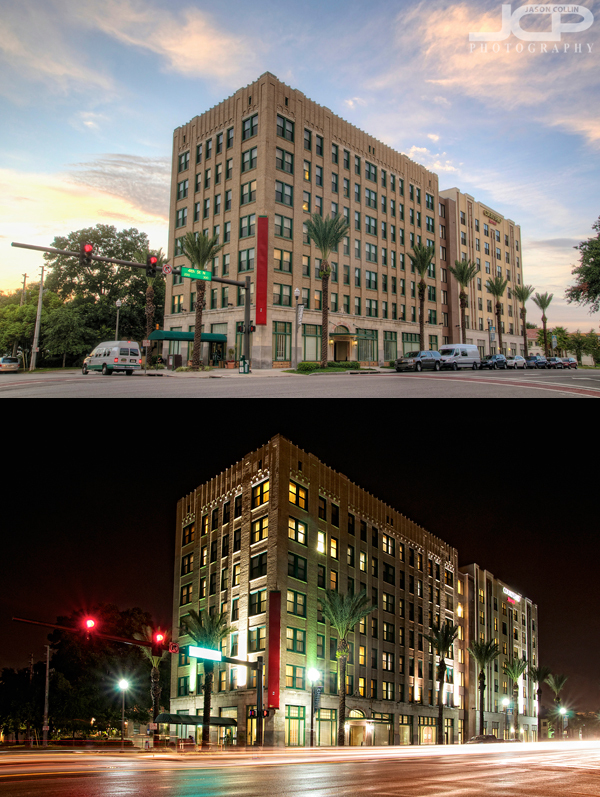 The Courtyard Marriott Hotel in downtown St. Petersburg, Florida: top in late afternoon, bottom at night after a rainstormThe client wanted both daytime and nighttime exterior shots of their hotel. I shot the daytime one first. Several days later I went to photograph the hotel at night, having to wait out a sudden rainstorm that sprang up as I was making the 5-minute drive from my home to the hotel! The daytime image is a 7-exposure HDR image and the bottom is just a single long exposure. As you can see a hotel in a city makes for a pretty good day & night subject. Anything that has cars passing in front of it or on it will allow for making a light trail long exposure night shot. Be sure and include a link to your day and night shot in the comments below.